Shortly after joining the site as a staff writer this summer, The Tuesday Zone suggested We Are the Best! (2013) might be a film I want to check out . And, because I am nothing if not punctual, I decided to give it a watch this week. Man, I’m dumb for waiting this long. 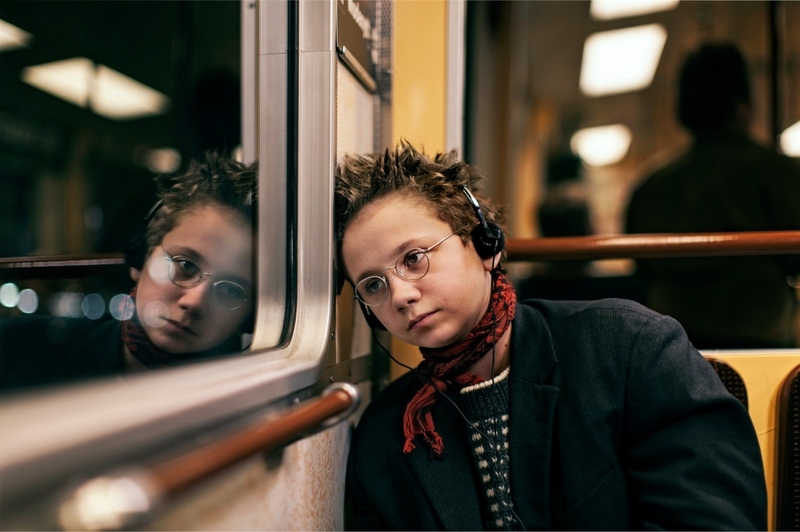 The plot: It’s Stockholm in 1982, and punk has been declared dead; a fact that hasn’t fazed 13 year old punkers Bobo (Mira Barkhammar) and Klara (Mira Grosin). While at a rec center after school, the two sign up for time in the building’s musical practice space as a means to inconvenience the teenage boys in the center’s resident metal band. With far more enthusiasm than talent, Bobo and Klara set about writing a song. At a school concert, the pair sees fellow misfit and expert classical guitarist Hedvig (Live LeMoyne) perform, and invite her to join the band. As their band slowly gets better, the trio’s friendship grows stronger as the face a harsh world of preoccupied parents, discovering boys, and the many injustices of 7th grade. In spite of its loud title, We Are the Best! is a surprisingly quiet movie. 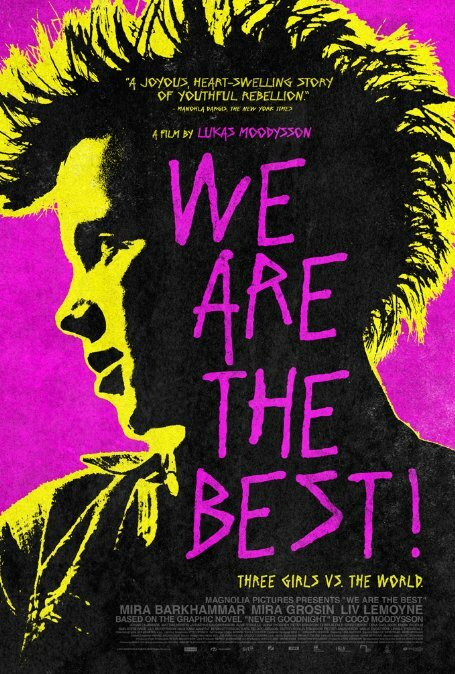 Directed by Lukas Moodysson based on his wife’s graphic novel about her experiences growing up, We Are the Best! is filmed in a naturally-lit, no frills style that compliments the no-frills music at the film’s heart. Similar in theme and style to some of Richard Linklater’s work, there were a few instances where I had to remind myself that the film was not actually a documentary, due in large part to the amazing performances from the three adolescent leads. Neither quippy or conspicuously adult, the three girls at the center of We Are the Best excel at being 13 years old. This isn’t a put-down, but rather high praise. The three stumble over words and behave in ways that should be familiar to anyone who’s ever been 13*, and the movie is better for it. I am many things, but a girl who grew up on punk in 80s Sweden is not one of those, yet the experiences of Bobo, Klara, and Hedvig resonated deeply. There’s something universal, I think, in the way the girls use music and the culture that surrounds it as a way to navigate adolescence and self-identify. For Bobo and Klara, bands become totems and currency, invoking the names of bands and citing obscure singles both to separate themselves from mainstream culture and to try and impress two punk boys they read about in a fanzine. Watching Bobo watch from the sidelines as her friends flirt gave me very specific flashbacks to being at middle school dances in the Led Zeppelin t-shirts that served as both shield and proud uniform. Pictured: every teenager, at some point. Yet the music is not the point of the film. Well, not the band, at least. This isn’t a School of Rock paean to the power of rock, but rather a tribute to the power of friendship. Before you force close this review due to the cheese of that last sentence, hear me out. The band only gets marginally better over the course of the film, but the friendship of the bandmates evolves as they face triumphs and hardships. The reserved Bobo’s friendship with the more confident Klara grows from a simpler childhood friendship into a more complex and adult one as they face their first fights and must resolve their issues and insecurities. Hedvig, while less central in the film than the other two, grows tremendously, learning first how to stand up for herself against her friend’s wishes, and eventually becomes their stabilizing force as Hedvig proves to be the more emotionally mature of the three. It’s an emotionally honest portrayal of the occasionally tumultuous middle school friendships that anchor your tween years. Through their friendship, the band overcomes embarrassing or unavailable (though refreshingly three dimensional) parents, condescending dudes young and old, and even the boos of the meanest Christmas concert crowd ever. I’m hesitant to call We Are the Best a feel-good movie. While it has a irrepressible humor and ultimately sunny outlook, it’s not setting out to warm hearts. This is a movie that knows you need to experience the pain of early teendom to appreciate its joys, and We Are the Best unflinchingly portrays both. Anyone who ever sat up at night worried about dating or ever found solace and secret personal meaning in a rock song is going to see themselves somewhere in this movie. Parents who can stomach some swearing could do worse than share this with their teen. We Are the Best is a movie that utterly captivated me at 23, and one I wish I had when I was 13. Look for We Are the Best! streaming on Netflix and available on VOD and DVD/Blu Ray. *To the 12 and under set reading this for some reason: welcome to the wonder years, kid. It’s gonna be a bumpy ride. Great review, though I have to wonder which Norse god the director had to upset to get the name Moodysson. How appropriate for a movie about teenagers.